Tesla has just published its Q2 2016 Updates for its customers and shareholders. In the letter, the company had more details to share about its future electric vehicle Model 3 soon to be released end of 2017. The design phase of the Model 3 for tooling, production planning and validation has been completed, as stated in the letter. This falls in line with Elon Musk's interview at Code Conference on June 2nd 2016 where he hinted that the design will be finished in 6 weeks. Furthermore, during the Gigafactory grand opening, Tesla's President of Global Sales & Service Jon McNeill confirmed to guests touring the factory that the design of Model 3's exterior was completed. The red Model 3 featured at the showroom of the factory had tinted glass, blacking out all the instrument cluster that has yet to be finalized and revealed in the second part of the vehicle's unveiling as mentioned by Elon Musk. According to Tesla, its "machine that makes the machine" philosophy will be put to the test once the Model 3 is in production phase. Production hours per vehicle are declining and the company is focusing on squeezing as much tools and custom made machines on every inch of the work floor to maximize the speed of vehicle output in its Fremont factory. In addition, the Gigafactory is on target to produce 35GWh/year of cell units by 2018 after the company managed to accelerate construction on the site, allowing it to meet the targeted production volume of 500,000 vehicles in 2018. Panasonic announced last week it would raise up to $3.86 billion in corporate bonds to bring forward its investment in the Gigafactory. Tesla's operating expenses are expected to increase by about 30% due to the Model 3 vehicle engineering, design, and testing expenses related to Model 3 supplier contracts. Some of Model 3 production equipment is already going live at the stamping and painting centers, while the body and general assembly centers will be built later this year. 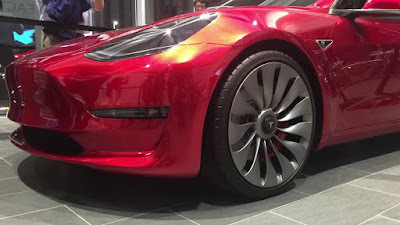 During the Q2 Q&A conference call, Elon Musk confirmed production of Model 3 will start in July 2017, however due to the long list of suppliers and parts involved in manufacturing the vehicle, Musk is expecting some slight delay on that date, hinting that any supplier failing to deliver on time will be left behind. I don't expect us to be at full production on July 1, but I have to drive all suppliers and internal efforts to that date, knowing that some will fall short. And those that fall short, the suppliers that fall short will be cut out of the picture. And if there are teams internally that fail to execute effectively, we will reorganize those teams. You can read the full Q2 2016 Updates here. Informative post. Thanks for sharing such a post. Wow! The model is looking just awesome. So, it has been finalized now. Electric cars are in more demand these days. Keeping eyes on the raising price of fuel/gas, the preference of users has been changed almost. Electric, hybrid and solar cars are having the most demand these days as they need less maintenance and also pollution free. Talk to the European auto specialist Rancho Cordova for more info. Thanks for sharing the latest update at Code conference. This model is going to have a blast in the auto industry.